Just as widgets allow code to generate content for use inside a WordPress sidebar, shortcodes allow code to generate additional content inside a post, page, or other content type. Widgets can add functionality, navigational aids, and other useful bits of information to your sidebars. What if you want to add dynamic elements (such as automatically generated lists of related content or embed videos) without having to switch to the HTML editor and dealing with complex embed codes? Such situations are where shortcodes come to the rescue. 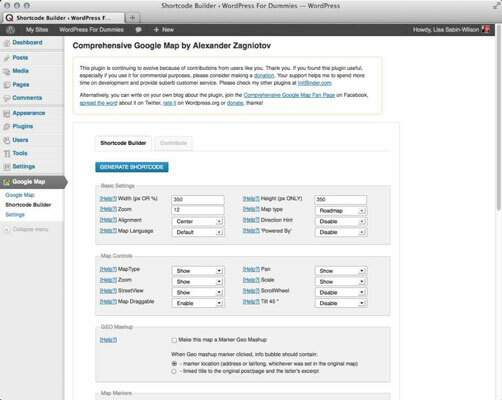 One of the shortcodes built into WordPress is the gallery shortcode. In many ways, shortcodes look similar to HTML tags. The gallery shortcode looks like an opening HTML tag that swapped the < and > characters for [ and ]. Shortcodes also have the capability to surround text by using an opening and closing shortcode. 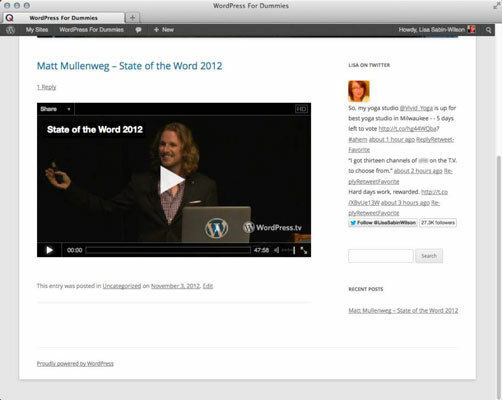 The embed shortcode, another shortcode provided by WordPress, is one. 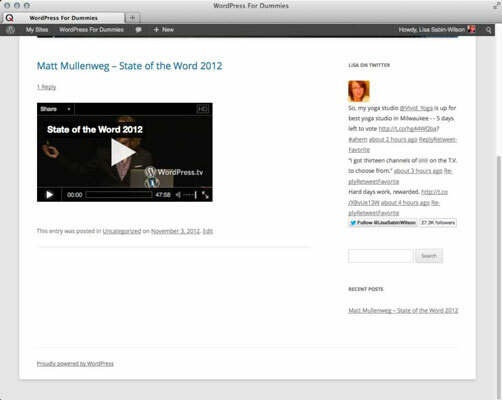 By adding this to your post or page content, Matt Mullenweg’s 2012 State of the Word video displays in place of the shortcode. Notice how the entire video is smaller. This is because reducing the width to 400 pixels automatically scaled down the height as well. If both the width and height arguments are used, the video is scaled down to fit inside a box of those dimensions, so you won’t be able to distort the aspect ratio of the video if you don’t get the dimensions exactly right. In practice, it’s often easiest to simply supply the width argument and not the height argument. The Twitter Widget Pro plugin provides more than just a widget; it also adds support for the twitter-widget shortcode. This shortcode provides the same functionality as the widget except that it can be added to content and uses the shortcode method of controlling arguments rather than a widget editor. Note the username argument is set to my Twitter username, lisasabinwilson. When using this shortcode, replace the lisasabinwilson username with the Twitter username that you want to use. The title is modified and replies are hidden. This means that you can easily produce the same results whether you decide to use Twitter Widget Pro’s widget or the shortcode feature. 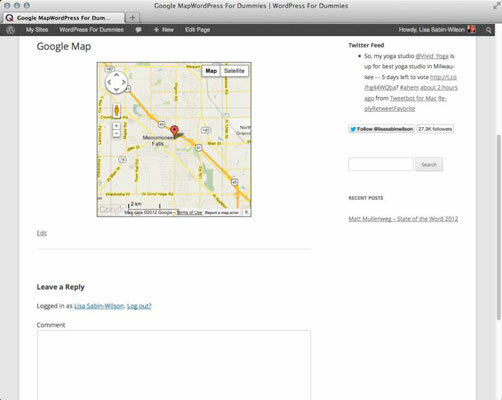 The Comprehensive Google Map Plugin offers both a widget and a shortcode that allow for easily adding a Google map to your site. That would be quite difficult to manually type without any errors. Fortunately, the Comprehensive Google Map Plugin provides a shortcode-generator tool that makes it easy to have the code generate such complex shortcodes. After activating the plugin, follow these steps to use shortcode. Click the Shortcode Builder link under the Google Map Dashboard menu to load the tool to generate new map shortcodes. In the Location setting in the Map Markers section, fill in your location details and then click the Add button for the Location setting. Click the Generate Shortcode button at the bottom of the page to get the generated shortcode. Copy the supplied shortcode and paste it into a post or page. Click the Save Changes button and then view the updated content. The shortcode produces an interactive map that visitors can easily navigate through. By clicking the marker, visitors can access options to get directions to or from the location. Although you should always give an address, the map gives visitors a much better understanding of where a location is, which means they won’t have to leave the site to look up the address elsewhere.